Chances are you've seen a Woodway 4Front in your local health club, especially if they carry high end equipment. These unique treadmills look nothing like traditional machines, as their design makes them stand out from the crowd. 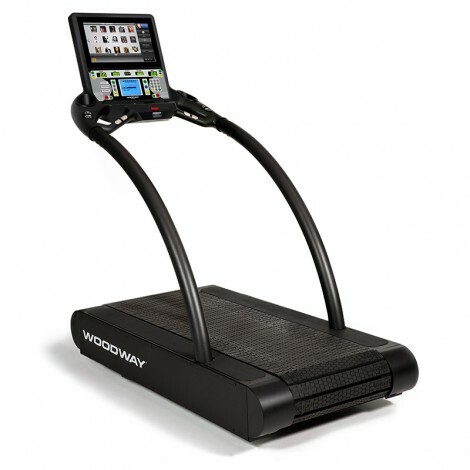 The WoodWay 4Front is an all black treadmill with a completely open design and curved arms. It features individual slats rather than the traditional belt, which reduces impact and requires much less maintenance. You also have your choice of consoles. The 4Front is one of the most popular Woodway models and reviews have been very favorable so far. Along with the manual Curve, it offers a unique spin on traditional treadmill training. 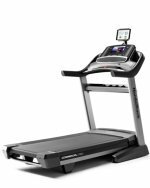 The company hasn't made too much headway into the home market yet as the prices for their treadmills are very high, but if you want something truly unique and have the budget these are definitely worth a look. The 4Front features individual shock-absorbing slats joined together rather than a regular belt, which have been shown to be easier on your joints and muscles. They also require much less maintenance, lasting over 150,000 miles before needing an adjustment. Lastly, because there is no deck, there is much less friction, which equates to lower electricity costs. There are four different console options, including a standard Group Training LED, a Personal Trainer LCD, 4Front View with HDTV and a ProSmart 10.1" touch screen. Each comes with different features and capabilities, with the top of the line ProSmart giving you a web browser. The design of the 4Front gives you a ton of flexibility, with the openness allowing for not only forward running, but also backwards, sideways and other variations to target different muscle groups. That's why trainers love these new treadmills and use them for their cardio classes. Some other key features: a generous 22" x 68" running surface, larger than most residential models, a 400 lb. running/800 lb. walking max user weight, optional incline/decline/speed expansion. As we mentioned, these are very expensive treadmills, in the neighborhood of $10,000 new, so they are pretty much out of reach for most of us. As such, you want find too many reviews online. But believe us, these treadmills are incredible if you can swing it. You'll have that 4Front in your home for the rest of your life. The Woodway 4Front has become hugely popular over the last few years, popping up in gyms across the country. If we had $10,000 lying around, we would absolutely snap one of these up for our home gym. Do you need it? Absolutely not. You can get an incredible high end treadmill from Matrix or Life Fitness for less than half that price. But if you want an extremely low impact, commercial machine with the ability to run forwards, backwards and sideways with incline and decline, Woodway is the only company that combines it all. If you do buy a Woodway 4Front, please send us your feedback as we'd love to have more information on these treadmills from actual users.